The celebration of a special event led my wife to decide we should take a trip to Ogunquit to enjoy the beautiful scenery and consume some food and drink while we were there. I suspected she was right and was more than happy to take the trip south where I figured it might be fun to get outside my regular stomping grounds and try some grub from a restaurant of which I’d never even heard the name. So after considering a couple different places, that’s exactly what we did, landing at Northern Union on an absolutely stunning summer Saturday. We parked and walked in past the owners watering the flower garden out front. 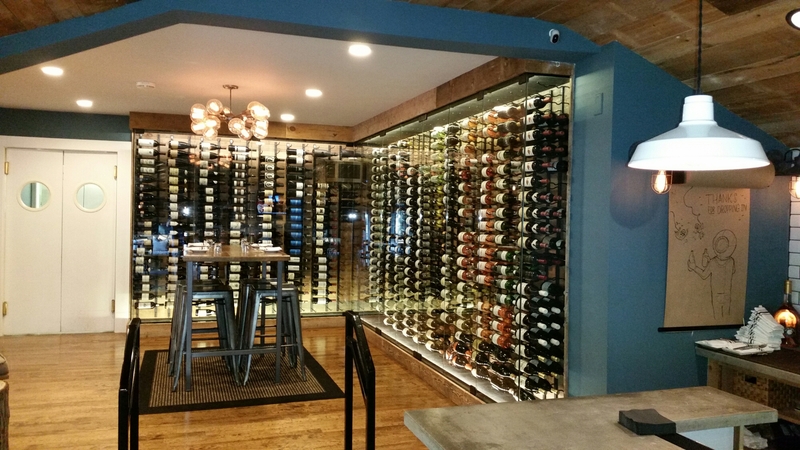 As we entered, my wife went to the bathroom by the entrance to adjust her make-up and I scoped out the bar, noting a few specials on the chalkboard and the room full of wine next to me. A bartender approached and offered me a drink, but I told him we were celebrating a special night together, so I would wait for her to return and we would order at the table. Mrs. Portlandeater soon came out and we walked past the wine to the host counter and were promptly seated. Northern Union was clearly a house in its past and consisted of many separate rooms. There was a rustic feel which provided a really comfortable ambiance which had me hopeful for some top notch cuisine. We sat and took in everything around us for a moment and then moved on to looking at the menus. Several specialty cocktails were available and just a handful of beers, but NU prides itself on being a wine bar and the wine list was appropriately extensive. I gave it a brief glance, but as usual, hoped to pluck out a cocktail that met my desires that evening. Toasting to health, happiness, and hip-hop, we applied the sparkling liquid to our palates. With it’s light fruit flavor and barely-there bubbles, we thought it was one of the best sparkling wines we had ever consumed. Though we’re not heavy drinkers of the stuff, we agreed that this one was an outstanding choice and after asking found out it was Carletto from Veneto, Italy. Pro tip – a quick search of the internet revealed that it sells for about 14 bucks per bottle. If you like sparkly wines, pick one up. It’s really good. Once we sucked down the comped Carletto, we received our cocktails. 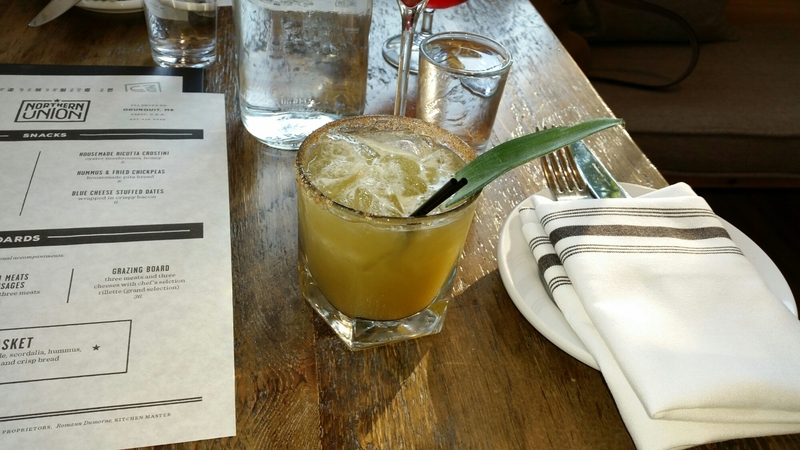 A quick sip of my marg provided a beautiful pineapple base with the cucumber and jalapeno adding more freshness than fire. A cumin-ed rim added a little extra spice, but still, the refreshing element was much stronger than any heat in the drink. We were both quite pleased with what we had ordered and started to pick out a bunch of items we wanted to eat. The menu had headings of Snacks, Boards, Starters, and Mains. We decided on a few snacks and starters, after which we would decide if we wanted more. When the waitress came back, we placed our orders and asked her to bring them out as they were ready. 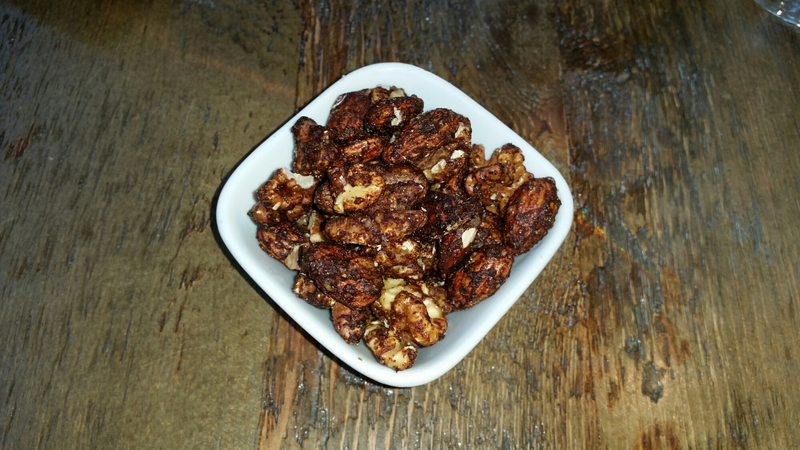 After just a short wait, the first of our item showed up – Spicy Mixed Nuts with cumin and cayenne. Primarily almonds and walnuts, the solidified spice coating gave a quick dose of cumin followed by the direct heat of the cayenne. They weren’t too spicy, but very flavorful and still with enough heat for a cayenne lover like myself to enjoy. 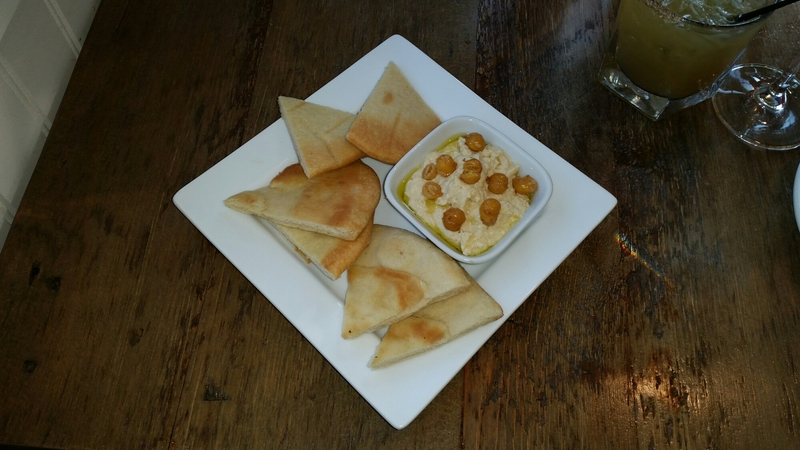 We were chomping on the nuts when our Hummus and Fried Chickpeas with housemade pita bread arrived. I didn’t waste any time on that one either, taking a pita triangle between my thumb and forefinger and swiping it through the hummus, making sure to shovel up a whole chickpea with it. “Oh, what a rush!” This was seriously potent hummus, with plenty of lemon and garlic added to the mash. 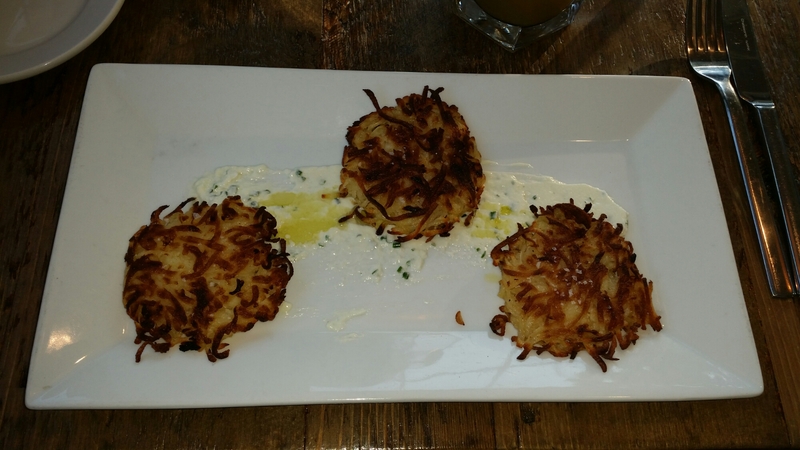 Our full attention was given to the nuts and hummus until we received Shredded Maine Potato Latkes with herbed crème fraîche. I tried a bite of the little potato pancakes and dunked it in the crème with panache. The light, crispy cake was nicely seasoned and the addition of the mild dairy sauce gave them a cool, smooth ending with a little bit of chive. Once again, we had a delightful dish and felt the food was turning out to be a nice combination of small plates. House-Smoked Meatballs with ancho BBQ glaze were the final act. As they laid in front of me, my wife commented that even though she didn’t eat beef, they smelled so good she almost wanted to try them. She was right. They smelled like a bit of magic covered in love. I sliced one of the spheres in half and shoved it into my meatball cavern. The chili smoke and sweet flavoring of the glaze was superb. 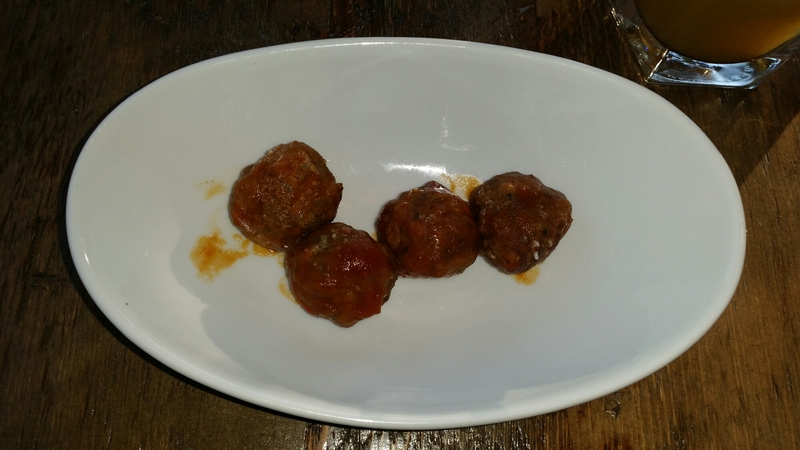 Even though I felt the ball was a little too meaty – more like a round, lightly seasoned hamburger than a soft, textured meatball – the BBQ coating made up for it with just the perfect touch of tongue tingling taste. Once we were done our orders of snacks and starters, we decided we should get something else to share. 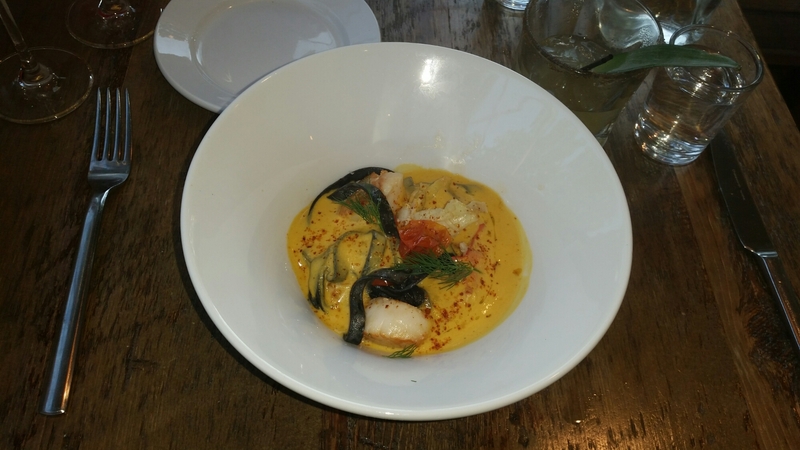 We figured it would be a good idea to try some seafood, and the Lobster Tagliatelle – housemade squid ink tagliatelle, lobster, scallops, roasted tomatoes, lobster sauce – sounded pretty damn good. We ordered that without hesitation and got ready to eat it by continuing to sip our cocktails and discussing the recent spate of celebrity deaths. After singing a rousing duet of Prince’s “Purple Rain” followed by heavy applause, our seafood and pasta dish arrived. Sitting between us, the bowl of lobster and other goodies looked and smelled great. I wrapped some of the tagliatelle with the creamy lobster sauce around my fork and slipped it into my mouth. It turned out that the dish wasn’t all good looks; the tagliatelle was an absolute perfect al dente, and the cream, though slightly rich, wasn’t at all overpowering. A bite of lobster was perfectly tender, not at all rubbery as can sometimes be the case when in a pasta plate. The scallops fit the bill too with the typical fresh, delicate taste those little flavor factories provide. A couple multicolored tomatoes and some rosemary sprigs added a little extra color to the mix. Every last drop of our meal went down the tubes and we passed on dessert. It’s fair to say that Northern Union was absolutely excellent. Our visit to Ogunquit was great, but NU was definitely the cherry on top. From the thoughtful and delicious prosecco offering, to our other drinks, and the starters and main course, everything worked together well with flavors that were powerful and filled the senses. The atmosphere, design, and service of the restaurant were also top notch, and the prices, at $101 after tip for the meal, were quite reasonable. This place has been around for two years now, but it’s not going anywhere soon because no matter what your pleasure, NU provides provides a very complete and well planned dining experience that you won’t soon forget. This entry was posted in Portland, ME food on June 29, 2016 by peterpeterportlandeater.